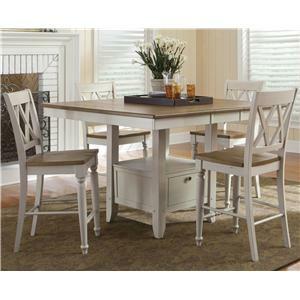 Incorporate classic farmhouse style into your home with this solid hardwood single pedestal 36-inch round pub table set. With the table's turned pedestal base and the turned legs of the arrow back counter stools with contour seats, the set adds style and comfort to any casual dining space or entertaining area where you gather with family and friends in your home. This counter height table set is available in Black Cherry Finish (BC) and Chestnut and Cinnamon Finish (CCN) or additional finishes (not shown): Newbury Golden Oak (NG), Buttermilk and Honey (BH), and Cinnamon (CN). 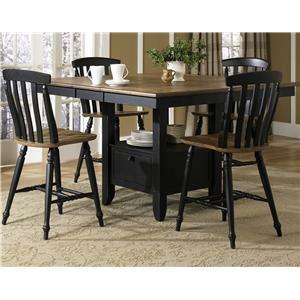 The Pub Sets 3-Piece Solid Hardwood Pub Table & Arrowback Stool Set by Amesbury Chair at Dinette Depot in the Brookfield, Danbury, Newington, Hartford, Connecticut area. Product availability may vary. Contact us for the most current availability on this product. 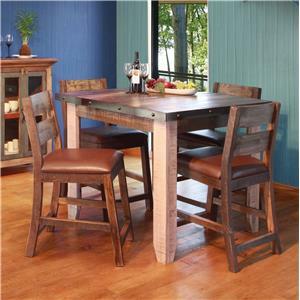 The Pub Sets collection is a great option if you are looking for Casual furniture in the Brookfield, Danbury, Newington, Hartford, Connecticut area.